The Micro-Surgical Assistant Workstation is a system which is designed to aid and augment the performance of micro-surgical tasks by a human surgeon. A micro-surgical task is simply a surgical task which is performed on such a small scale that it must be done while looking through a microscope. There are two main components to the workstation; the first aims to give the surgeon better knowledge about the field of operation, and the second aims to give the surgeon a better ability to execute very precise motions with surgical tools even when working at a microscopic scale. One example of the first component would be providing the surgeon with information about the surgical environment which would not normally be available, such as overlaying images from another imaging modality (eg. CT, MRI, OCT, Fundus), which would be registered in real time to images captured through the operating microscope. The current example of the second component is the Steady Hand Robot, which is a cooperative manipulator designed to improve the fine motor control of a surgeon. The surgeon and the robot both hold the same tool; when the surgeon exerts a force on the tool, the robot detects that force, and moves the tool correspondingly. Having the robot in the loop allows us to do force scaling, effectively slowing down the motion of the tool; this allows for more precise positioning than could be done free hand. Additionally, the robot gives greater stability, as a tool can be released by the surgeon and will stay in the same position, rather than falling. 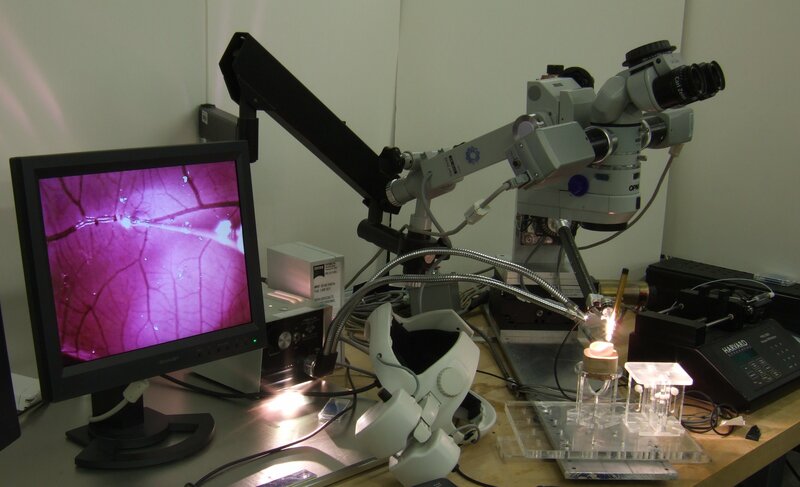 The current model on which the Micro-Surgical Assistant Workstation is being developed and evaluated is a retinal-surgery model, and several retinal surgery tasks have been attempted with the robot. Ben Mitchell, John Koo, M.D., Iulian Iordachita, Peter Kazanzides, Ankur Kapoor, James Handa, M.D., Russell Taylor, Gregory Hager. Development and Application of a New Steady-Hand Manipulator for Retinal Surgery. In International Conference on Robotics and Automation, April 2007. Henry Lin, Maneesh Dewan, Panadda Marayong, James Handa and Gregory D. Hager. Vision-Based Human-Machine Collaborative System for Ophthalmic Micro-Surgery. Medicine Meets Virtual Reality, 2006. Henry C. Lin, Panadda Marayong, Keith Mills, Ray Karam, Peter Kazanzides, Allison Okamura, Gregory D. Hager. Portability and Applicability of Virtual Fixtures Across Medical and Manufacturing Tasks. In Proc. of International Conference on Robotics and Automation (ICRA), pages 225-230, 2006.